Did i mention that i was organizing this thing, as well as trying to race in it? I really don't recommend doing this sorta thing..save yourself a lot of stress and either race or organize..don't do both! Somehow, i think i pulled it off tho, and all the riders had fun. I wrote an overall report, it's posted here. Next time hopefully i'll have someone working the computer and doing announcements..those seemed like the biggest drains.. This could have more accurately been called a 30 lap keirin. It was NUTS! By about lap 4 we were up to 50kph, and basically pinned that the rest of the race. There weren't really any attacks, and instead, riders were simply shelled off the back. A race of attrition one might say... It was also a combined race, with the A's & B's, and many of the B's were dropped pretty quick.. Nothing much to report here, i hung in there, and finished 7th, with 9 A's starting. My stomach was bothering me a bit in the race as well...too many carbs and juice...not quite enough solid food! Oh, we had a Madison before this, as the opening event of Trackfest - it was a good warm-up! Ahh..my favorite race.. I rode a bit more aggressively, staying up near the front 5 riders. There was a little break for the first points grab, and i was in for it. A few laps after that i saw a break happening off the front, and jumped in on it, and before we knew it we were away!! There were four of us - perfect! My buddy Glenn Barr, strongman Mike McCorkell, Mike Cooper (my nemesis from Thursday's, but not a concern since he was racing B) and myself. Eventually we started collecting lapped riders, and Matt Chater was the only person really chasing, and was bridged up to us, and basically collected the rest of the top points..he was on fire and outclassed pretty much everyone. Happily, i finished 4th in that event, behind Matt, Glenn and Mike McC. I was pretty happy with my riding. Roland, who took these pics, rode amazingly well - getting lapped, but then hanging in with us the rest of the race. I doubt i could have done that a year ago!! There was another Madison somewhere in there as well, Chad made a great teammate. 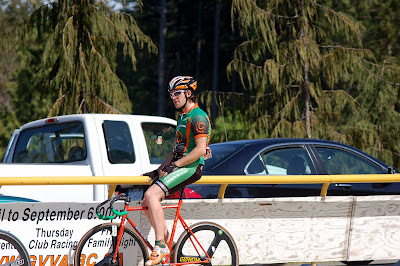 So, that's my Trackfest race experience! I think i actually managed to peak pretty well for the day...i think i'm starting to figure this part of it out. I also managed to pick the right gear for the day (46x14 - my smallest rings! ~88") I raced pretty smart as well, and i'm really looking forward to Provincials (Aug17-19) - i hope to get in a nice build for that. Before that is another Trackfest, on July 7th.. It was cool to see and race with the Vancouver peeps - i'm a bit envious, because by looking at the results, it's clear they've got a leg up on us, speed-wise.. If we hit 50kph here, it's a sprint, not a sustained effort.. Definitely need more of that here to ensure we're competitive. If you read that race report, you'll see that the Vancouver folks dominated both in the sprints and endurance events..and their B & C categories are significantly faster than here...and it's scary to see that *i'm* the top endurance guy from Vic..!! What happened to all the other A's..? !